Check out this HOT deal on this Eyeshadow Palette 18 Colors Highly Pigmented Eye Shadow Palette, 11 Matte + 7 Shimmer, Long Lasting Waterproof Colorful Eyeshadows Cosmetics Priced at only $9.99 CLIP 5% COUPON FOR ADDITIONAL SAVINGS! Ships Free with Amazon Prime! 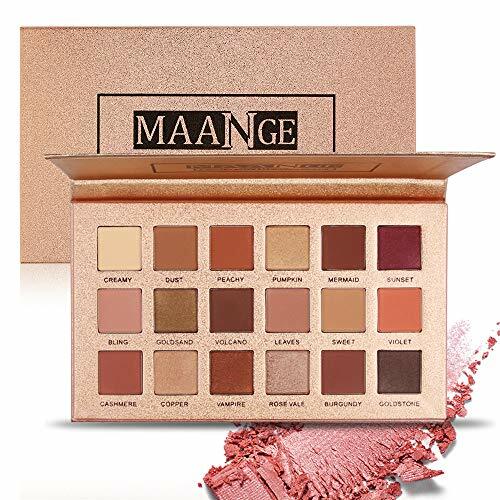 ✦Best Gift for Christmas ,Got 5%OFF with Coupon.18 Shades With POP Colors: MAANGE Eyeshadow Palette is picked with 18 popular colors, 11 Mattes Eyeshadow and 7 Shimmer Eyeshadow.Each color is unique, beautiful and super shiny.It’s easy to use and looks great on your eyes. ✦Highly Pigmented,Soft and Smooth: Super creamy, velvety soft and smooth, both the shimmer and matte shades are high pigmentation and easy to blend,giving you comfortable using experience and shinny eyes. ✦Rich color completely meet all the essential need,pigmented eyeshadow palette can always bring you different creative look in different occasions.Perfect for professional smoky eyes makeup, wedding makeup,party makeup or casual makeup. ✦Safe for sensitive skin and Not Tested on animals.Pretty packaging with shiny gold cover.